Posted November 27, 2018 in Diet Management, Featured Post, On a Budget, Tags: National Peanut Butter Month, peanut butter, peanut butter phosphorus, peanut butter potassium, peanut butter protein, peanut butter recipes by Sue Yager, MS, RDN, LDN. What food is found in three out of four American households, loved by children and adults alike, a great source of protein, and also surprisingly kidney-friendly? The answer is peanut butter. And…November is National Peanut Butter month! Although it may be higher in potassium and phosphorus compared to other protein foods, peanut butter can be an excellent substitute for meat. This is good news for vegetarians, people who do not like meat, or those who are trying to reduce their intake of animal protein. Peanut butter may also be a low cost alternative to animal proteins. Peanut butter contains several beneficial nutrients. A sensible 2 tablespoon portion of creamy peanut butter has 190 calories, 7 grams of protein and almost 2 grams of fiber. Potassium content is 180 mg and phosphorus is 100 mg. Crunchy peanut butter is slightly higher with 240 mg potassium and 107 mg phosphorus. Sodium varies from 5 mg for unsalted peanut butter, 65 mg for reduced-sodium, and 150 mg for salted peanut butter. (Nutrient values are from the USDA Nutrient database which averages several varieties of peanut butter.) To pick the healthiest option, look for peanut butter made with just peanuts. Some peanut butter brands contain sugar, salt or oil. How does peanut butter compare to meat? On average, an ounce of meat or poultry contains 7 grams of protein, 100 mg potassium and 65 mg phosphorus. Pure peanut butter, either smooth or crunchy, is a healthy food. Peanuts are heart healthy. In fact, studies suggest that peanuts lower cholesterol, especially LDL (the “bad” cholesterol) 2. Other nutrients that are plentiful in peanuts and peanut butter are vitamin E, folate, and zinc. Unhealthy exceptions include peanut butters made with hydrogenated oils and those with added sugars or corn syrup. Fortunately, many peanut butter manufacturers have reformulated products to remove trans-fat from hydrogenated or partially hydrogenated oils. It’s best to compare labels and select peanut butter with the fewest ingredients. Peanut butter can be eaten in a sandwich or paired with an apple or celery, to create a satisfying meal or healthy snack. If the increased amount of phosphorus is a concern, ask your dietitian or doctor if a phosphorus binder is needed with a peanut butter meal or snack. 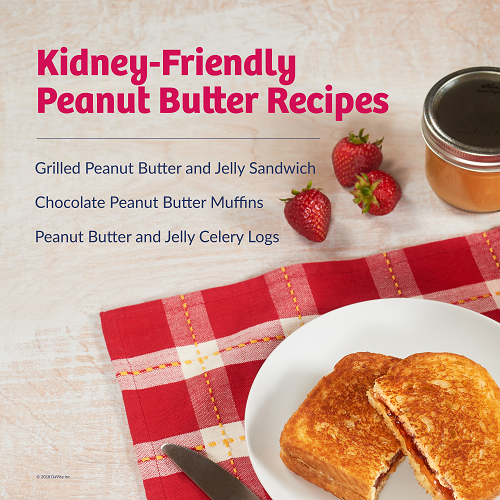 DaVita’s Grilled Peanut Butter and Jelly Sandwich is a twist on the traditional preparation of the classic peanut butter sandwich. Additional recipes include Chocolate Peanut Butter Muffins and Peanut Butter and Jelly Celery Logs. USDA Food Composition Database; https://ndb.nal.usda.gov/ndb/ Accessed 11/8/18. The Peanut Institute. http://www.peanut-institute.org/health-and-nutrition/disease-prevention/heart-disease-details.asp. Accessed 11/8/18. What’s in a jar of peanut butter? M. Spano RDN; https://peanutbutterlovers.com/blog/whats-in-a-jar-of-peanut-butter/ Accessed 11/8/18. 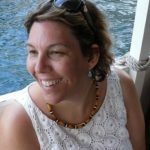 Sue works as a dietitian in Carpentersville and Marengo in Illinois She has been a dietitian for the past 15 years. The last eight have been in kidney care. In her spare time, Sue enjoys reading and riding her bike. I have my type 2 diabetes under control, bp good , cholesterol levels good, but eGFR has dropped! Am so confused with what l can eat or not eat ! eGFR shows your stage of kidney failure. It’s great that you are putting your health first and managing your diabetes and blood pressure. Keep it up even though it may not prevent further changes in GFR. The underlying cause of kidney disease is still present and most likely contributing the GFR drop. If you were not managing your conditions chances are your GFR could drop faster. I’ve just been told my creatinin levels are slightly elevated, also had lots of breathlessness during night. I increased my water intake substantially, no breathing problems, does dehydration cause histamine levels to rise? My blood sugars are well under control. No meds just diet. I am unsure–please ask your doctor. Is calves liver .. with onions only ok for a dialysis patient? I know it is nutritious for most and actually like it. The main concern with liver and other organ meats is the high phosphorus content. Discuss your phosphorus control with your dietitian and ask if calves liver can be included in your diet, how much and how often. As with most diets foods can be placed in the include and avoid lists. This is one way of following a diet, but not the only way. When you are planning meals using a tool like DaVita Diet Helper, you can create meals that include most foods–it is the amount and frequency along with combination with other foods that matter. I encourage you to try this online meal planner to allow more flexibility in your son’s diet. As always, work with his dietitian who knows much more about his individual needs. Please suggest diet plan for my 8 year old son suffering with Alport Syndrome. Please ask your doctor for a dietitian referral as your son will need a nutrition assessment, a meal plan and ongoing monitoring. ABOUT FOUR-YEARS-AGO, I ATTENDED YOUR CLASS AND RECEIVED INFORMATION. ONE OF THE FORBIDDEN FOODS WERE PEANUTS. ARE YOU SURE PEANUTS ARE OKAY? ALSO, SWEET POTATOES. AVACADOS, TOMATOES, AND YOGURT WERE ON THAT SAME LIST. WOULD YOU SEND A LIST OF FOODS TO AVOID TO MY EMAIL. IT’S FOR MY SON, HE’S ON DIALYSIS NOW. THANK YOU B.H. Most of the foods found on high potassium, high phosphorus and high sodium lists can be included in small amounts–but must also monitor the patient’s lab values. Since your son is on dialysis you have access to a renal dietitian who monitors his nutrition care. Please reach out to them for specific recommendations. The diet must be individualized considering nutrient needs, labs–but also food and cultural preferences. The food analyzer needs to be updated…there is nothing on the list for coconut nondairy products. I like the yogurt, eat perhaps half for breakfast with puff rice, blueberries, raspberries and coconut milk (don’t tell the farmers I call it milk). The rice product is the same or close? My stomach would rather not do soy. Rather new to this, going crazy trying to get all the #’s straight……have found a salt free bread, 14 carbs. Have seen the nephrologist 2x, no definite answer from him, but my reg Dr says CKD. I demanded the renal dept at the hospital provide me with some guidance on diet….your site much more helpful. You may need to be more specific in your search. I had many results for coconut milk, coconut creamer and coconut yogurt. You can also try searching by the brand name. Many, but not all results may be missing potassium or phosphorus since this information is not required. Also, if you have the product package you can enter the food into your personal Diet Helper database using the My Creations Add Food feature. I have stage three kidney diseases and need to lose 15 pounds by May 1st. Can you please supply a healthy diet with meal plans? You can use DaVita Diet Helper preplanned meals or create your own meals and track what you eat to help with your weight loss efforts. I suggest working with a registered dietitian who can counsel you and monitor your progress. I avoid mushrooms but like them. Which mushrooms have the least potassium? I take veltessa and my pot. Is within normal range. I have advanced CKD but not on dialysis. The common white, brown and portabella mushrooms have around 150 mg potassium for 1/2 cup raw. This is considered acceptable for a low potassium diet.